Although President Trump confidently highlighted the health of the American economy during this week’s State of the Union address, there was little discussion of the most serious threats confronting investors and financial markets. The president and Stacy Abrams, the Georgia Democrat tasked with delivering her party’s rebuttal, both glossed over our ballooning national debt and swollen annual budget deficit while discussing their respective visions for the future. We believe political leaders—on both sides of the aisle—have grown far too comfortable kicking the can down the road when it comes to national debt. 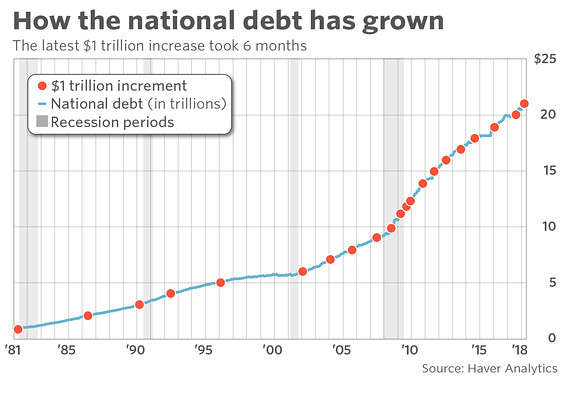 The proof is in the pudding when one looks at rising debt levels in recent years. Despite the necessity to enact fiscal discipline and restraint, we’ve learned once again this week that Washington, D.C. is more focused on funding new initiatives—such as infrastructure spending—with borrowed money rather than making tough choices. This is the case even though the economy is healthy enough at the moment to wean itself off excessive interventionist policies. Why Is the Debt Bell Ringing Now? As we enter the late stages of a historic economic boom, interest rates are currently rising and central banks around the world are unwinding their balance sheets. We don’t play the game of trying to time markets, but the stage is set for a sharp debt-fueled downturn at some point in the future. At Swan, we have long held that excessive government debt threatens to eat into every investors’ financial future. That commonsense view, however, seems to be lost on Congress, the Federal Reserve and the White House. Each body continues to ignore the fact that every dollar borrowed today requires forgoing one dollar of future consumption plus the interest paid on that money. So instead of a dollar being used down the road to consume goods and services, that dollar—plus interest—will need to be spent instead on debt payments, thereby slowing economic growth. Advisors and investors must not forget that the U.S. economy is primarily a consumer-driven economy. Dollars not spent on consumption hurts corporate profits and, in turn, the valuations of the assets that the vast majority of Americans have exposure to. What Might a Debt-Fueled Downturn Look like for the Average Portfolio? If the status quo remains, the national debt will eventually place pressure on policymakers to either keep rates artificially low, sharply cut spending, or dramatically raise taxes. None of these outcomes bode well for investors primarily exposed to only stocks and bonds. Keeping interest rates historically low is an extension of a problem—not a solution. This scenario punishes fixed income investors and leads to anemic yields that often fail to provide adequate compensation for an underlying bond’s risk profile. Reducing government spending or stimulus is equally problematic, likely causing an economic slowdown and equity market correction, thereby hitting investors either directly in areas of employment or indirectly in their investments. Higher taxes will also eat results in diminished investment returns and less realized income. With all this context in mind, investors need to understand these likely outcomes, assess the risks, and redefine how they invest going forward. How Should Advisors and Investors Prepare? Redefine Investing. In our view, an investor who believes a well-diversified portfolio includes an allocation of 60% to stocks and 40% to bonds is not prepared to swim in an overflowing sea of debt. The good news is that investors and their advisors do not need to “hope and pray” while fundamental risks flood into asset markets. We believe utilizing options-based hedging strategies into portfolios may help provide the type of risk management needed to safeguard precious capital during a rough bear market. Our Defined Risk Strategy is designed to maintain “always on” exposure to stocks—via Exchange-Traded Funds—while significantly reducing downside risk through using long-term put options. Sooner or later, the debt balloon hovering over the economy is going to pop. Policymakers have almost guaranteed that outcome. The question for advisors and their clients should be simple: Do you want to take steps today to mitigate pain tomorrow? David Lovell, Managing Director – Head of Marketing, is responsible for Swan’s marketing and engagement initiatives. This includes development and execution of marketing programs for Swan’s websites, content, communications, events, and media. David began his career in the financial industry at Mass Mutual. David currently holds a Series 65 license. Picking Your Battles: Corrections vs Bear Markets Understand and compare the nature of market corrections vs bear markets, analyzes their impacts, and which is more important to protect against. Swan Global Investments, LLC is a SEC registered Investment Advisor that specializes in managing money using the proprietary Defined Risk Strategy (“DRS”). SEC registration does not denote any special training or qualification conferred by the SEC. Swan offers and manages the DRS for investors including individuals, institutions and other investment advisor firms. Any historical numbers, awards and recognitions presented are based on the performance of a (GIPS®) composite, Swan’s DRS Select Composite, which includes non-qualified discretionary accounts invested in since inception, July 1997, and are net of fees and expenses. Swan claims compliance with the Global Investment Performance Standards (GIPS®).